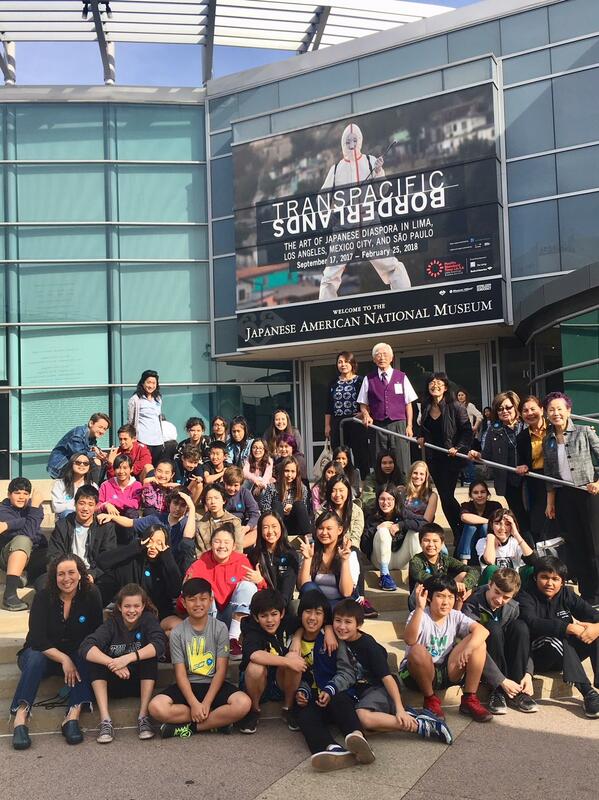 We took 60 students in the English Japanese Immersion Program at Glendale Unified School District to the Japanese American National Museum today. This is part of the year-long Rotary Global Grant Project: Peace Educational Project in Southern California. The goal of the project is to help students learn from the history to raise awareness, nurture peace, and take an action. The Japanese American docents who themselves were internees during WWII led the tour of the museum, where the students learned that 120,000 U.S. citizens with Japanese ancestry and their Japanese immigrant parents were interned in barracks in the desert immediately after the Pearl Harbor attack by the Japanese with a short notice, leaving behind most of their belongings. Many students were in disbelief to learn that a family of seven were placed in a small room similar to a two car garage, that the bathrooms were outside far away from their barracks, and that they ate in a mess hall. They definitely learned how dramatically common people's lives had to change because of war. On December 8, we will visit Dunsmore Elementary School to present books on peace for the Rotary Peace Library and seedlings of the Ginkgo survivor tree from Hiroshima. In January, 2018, Hibakusha Hiroshima survivors and the Japanese American internees will visit Dunsmore Elementary School, Verdugo Woodland Elementary School, and Wilson Middle School to speak to all students in the assemblies. As a finale of the Peace Educational Project, we are planning the first Rotary Community Peace Conference at the Japanese American Cultural & Community Center in Little Tokyo, Los Angeles, on Saturday, April 14, 2018. There the students will present their group projects on peace and participate in a speech contest on peace. There will also be a line up of great speakers and presenters from Hiroshima Peace Culture Foundation, Nuclear Age Peace Foundation, Rotary Peace Fellow, Physicians with Social Responsibilities, Amnesty International, etc. It is a free conference for all in the community.